When Bahamas Speed Week 2012 kicks off in late November, there may be some surprisingly familiar faces under those racing helmets. More Bahamians are participating in the upcoming series of events than last year and cars that have been gathering dust in garages are gathering steam as the one-time social event of the Bahamas’ calendar year comes back to life with faster, sleeker, shinier cars than ever before. Nine local cars have already registered with some putting in an appearance at the Paddock, others planning to roll through town at speeds of up to 120 miles an hour during the Island Tour that traverses New Providence and the bravest ones taking part in time trials and hill climbs. “There’s something for everyone,” says Event Director David McLaughlin. It was local entry — Peter and Pippa Vlasov’s Ferrari 275 that stole the local good looks show last year, earning honours following the Concours d’Elegance as the car you’d most like to take home. This year, Vlasov will drive an Austin-Healey MK 3000 while Pippa, will compete in a Mini Cooper S.
Crowd pleaser Don Aranha will take to the track with his 1961 Corvette, a vehicle he rebuilt after finding it abandoned in a garage in what he called “in shambles” and spent years rebuilding. He recently turned down more than $100,000 for the beauty. And everywhere Aranha goes, the ooohs and aaahs follow. Another local, Jim LaRoda, a Bahamas post office department manager, was everywhere in 2011. The Abaco native now stationed in Nassau worked on engines, photographed events including the Pictet Gala Ball and Auction of Promises, and wrote the road map for the 007 Island Tour. “I designed the specifications for the tours they do in the U.K. and it took exactly as much time as we had planned,” he said proudly. 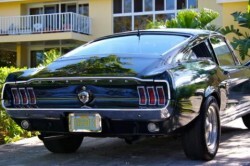 Sunshine on Sean McWeeney's shiny 1967 Mustang, a classic, brings out the beauty of the lines and reflects the care. McWeeney, senior partner at Graham Thompson & Co. and former attorney general, participated in Speed Week's Island Tour last year and said he looks forward to Speed Week 2012. This year, he hopes to have a car of his own in, even if just for show in the Paddock area. It’s a 1976 raspberry Mini. “Just hope the big rains don’t come so I can get it finished,” said LaRoda. Either way, show or participate in the Island Tour, LaRoda would like to see a day just for Bahamians introduced. And given the expectation of an Antique Auto Club exhibition of local classics, LaRoda’s wishes for a day just for local racers may not be too far off the track. Bahamas Speed Week organizers are also talking with the Bahamas Hot Rod Association. 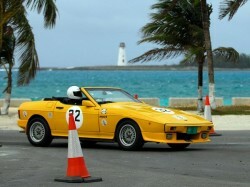 Bahamian architect Jason Lorandos is pictured in his TVR at last year's Bahamas Speed Week Revival with Nassau harbour as the backdrop. His driving partner, Pablo de Souza, is also local. 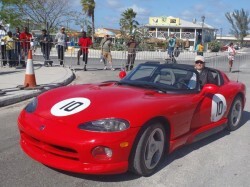 Bahamas Speed Week, revived in partnership with the Ministry of Tourism and other government agencies and private sponsors in 2011 after a 46-year hiatus, is slated again this year with some of the world’s most exotic cars already registered. Events, most of which are centred around Arawak Cay, run from November 24 – December 2. In addition to local entries, cars and drivers are coming in from the UK. US and Canada. The legendary Sir Stirling Moss is making his second appearance in as many years, returning as Honorary Patron of the event and Governor General Sir Arthur Foulkes is once again serving as Patron. caption: Top photo: A classy street party sponsored by Carlo Milano turned Bay Street into a glitz and glamour runway with classic cars as the stars, all helping to get Bahamas Speed Week back on track in 2011. Even more local participation is on tap for 2012.